I experienced good things in NAIA T3 that never in a million years will have experienced from a year ago to before that. The newly installed Philippine President Rody Duterte had promised massive changes in the country's current state during the Presidential campaign. Many were skeptic about his promises, but over 16 million Filipinos bet on the man and voted Duterte to the Presidency on May 10 this year. Despite lacking financial resources, mainly because the budget for 2016 has been spent by the previous administration, Duterte managed to keep his promises and actually delivered. Take Ninoy Aquino International Airport's (NAIA) case. Dubbed as the world's worst airport by foreign magazines, NAIA is slowly veering away from that namesake thanks to the strategic appointment of Cabinet members of the new administration. President Duterte appointed Arthur Tugade as chief of the Department of Transportation (DOTr), a businessman and lawyer from Cagayan. 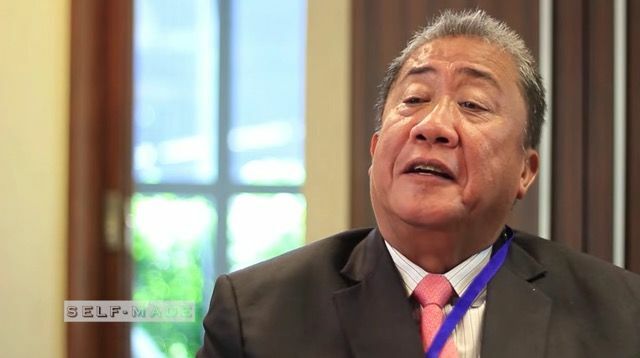 Tugade is widely known for his much revered stint at Clark Development Corporation. CDC's success was attributed to Tugade's no nonsense leadership. Netizen Dane Policarpio, a frequent traveler who's also part of a band, took notice of the massive changes at NAIA Terminal 3. 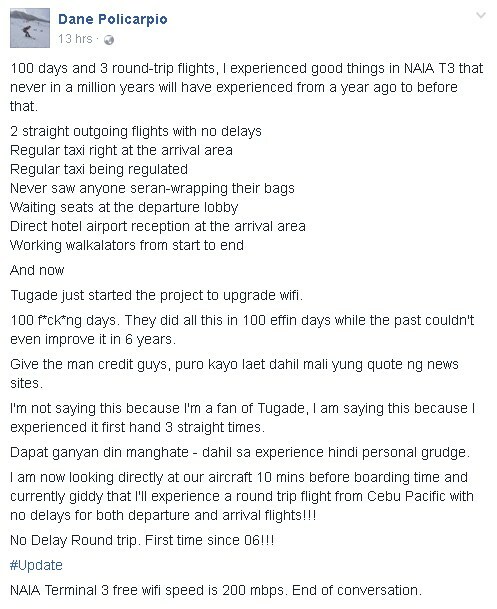 Policarpio details his recent experience at NAIA in a series of posts. 100 days and 3 round-trip flights, I experienced good things in NAIA T3 that never in a million years will have experienced from a year ago to before that. Tugade just started the project to upgrade wifi. 100 f*ck*ng days. They did all this in 100 effin days while the past couldn't even improve it in 6 years. Give the man credit guys, puro kayo laet dahil mali yung quote ng news sites. I'm not saying this because I'm a fan of Tugade, I am saying this because I experienced it first hand 3 straight times. Dapat ganyan din manghate - dahil sa experience hindi personal grudge. I am now looking directly at our aircraft 10 mins before boarding time and currently giddy that I'll experience a round trip flight from Cebu Pacific with no delays for both departure and arrival flights!!! No Delay Round trip. First time since 06!!! NAIA Terminal 3 free wifi speed is 200 mbps. End of conversation. It can be recalled that local media entities in the Philippines misinterpreted Tugade's 'state of mind' pronouncements weeks ago. Screengrab of Policarpio's Facebook post. Many netizens reaffirmed Policarpio's experiences and said in the comments that they had experienced the same when they traveled recently. He disclosed that he's not exactly a fan of Tugade, but points out the need to give credit where it's due. Previously, Journalists who are critical of President Duterte, also expressed their admirations to Tugade's swift actions. It can be remembered that Tugade inked a deal with airline companies that they will take care of the maintenance of the toilets at the NAIA, a move that observers describe as a simple yet very sensible. 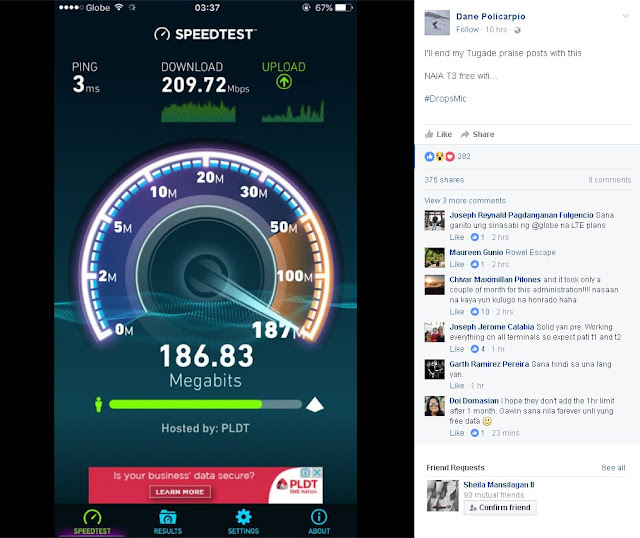 Policarpio ended what he calls as 'Tugade praise posts' with a screenshot of the NAIA's speedtest.net result. Have you flown and went through NAIA T3 recently? Did you have the same experience as Dane Policarpio had? What do you think of these improvements? Let us know what you think in the comments section.